A very healthy and delicious appetizer from the island of Sifnos! Serve it with some yogurt sauce as a great starter! 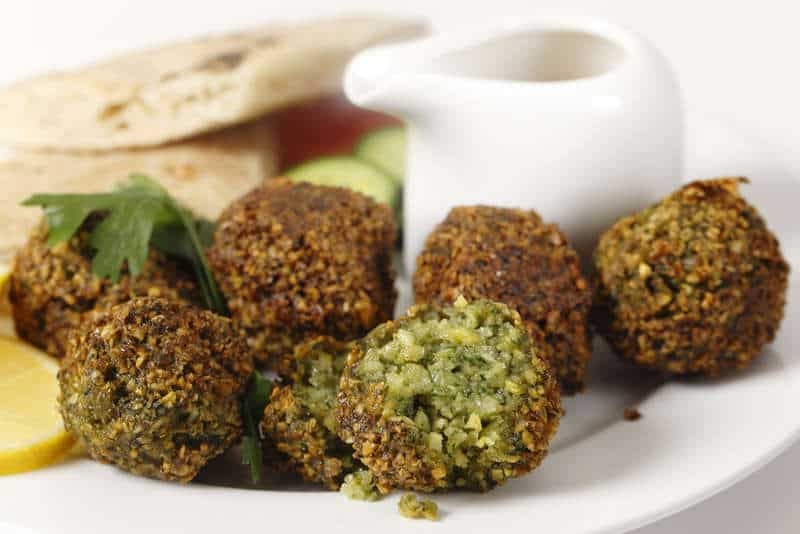 Discover how to make this greek falafel recipe to perfection! Soak the chickpeas into a large bowl filled with water and a pinch of salt for about 6 hours, or overnight. Drain and place them into a large pan, filled with water and boil for 40-60 minutes, until soft. When done, drain them into a colander. Place on some paper towel on a large tray and let them dry out completely for about an hour. It is very important that they dry out completely. In the meantime, finely chop the onions and garlic. Place a pan into medium heat, add 2 tbsps of olive oil and sauté, until tender. Use a food processor to mix all the ingredients together. Add the boiled chickpeas, the saute onions and garlic, along with the cumin and coriander and mix. Open the food processor, blend the mixture with a spoon and mix again. Repeat 2-3 times, until all the ingredients are combined. This should take 2-3 minutes. Into a large bowl, add the chopped parsley, 2 tbsps of flour and the chickpea mixture. Season well with salt and pepper and mix well, squeezing the ingredients with your hands, until combined. Roll the mixture into balls. Fry the balls into a very hot oil, until nicely colored on all sides. Place them on paper towel, to absorb the extra oil. For a healthier version, bake them in preheated oven at 180C for about 25 minutes. Brush the bottom of the baking tray and the top of the balls with some olive oil. Halfway through cooking time, flip the balls and put back in the oven. To prepare the sauce, add all the ingredients into a bowl and whisk, until all the ingredients are combined and the sauce is smooth and creamy. I made these on Sunday and they completely fell apart when frying. What consistency do they need to be when you stop pulsing?